Smoke alarms are such a normal sight that you don’t even notice them hanging from walls and ceilings anymore. However, no one can ever claim that they’re an attractive addition to your home, they just happen to be incredibly useful. This smoke alarm design is even more useful, plus it could actually be somewhat hidden from sight. 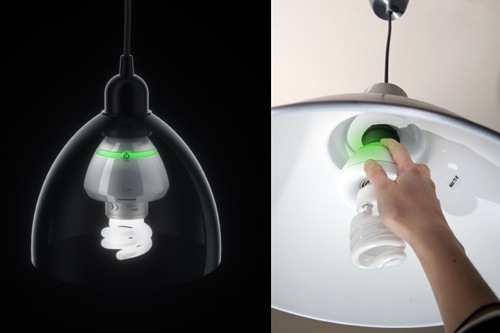 The Lum screws into your light socket on any lamp or hanging light and the bulb screws into the Lum. The smoke detector draws energy from the light when the smoke alarm is going off and will even power the light bulb for some emergency lighting. This design by Arthur Brault would be a nice solution so that you don’t have quite so many gadgets hanging from your ceiling. Since it is a concept you will have to wait a bit before it ever becomes a real product. Great concept, but wouldnt work in a lot of situations. Either the light shade would block ingress of smoke, of the socket would be too far from roof (where smoke collects).